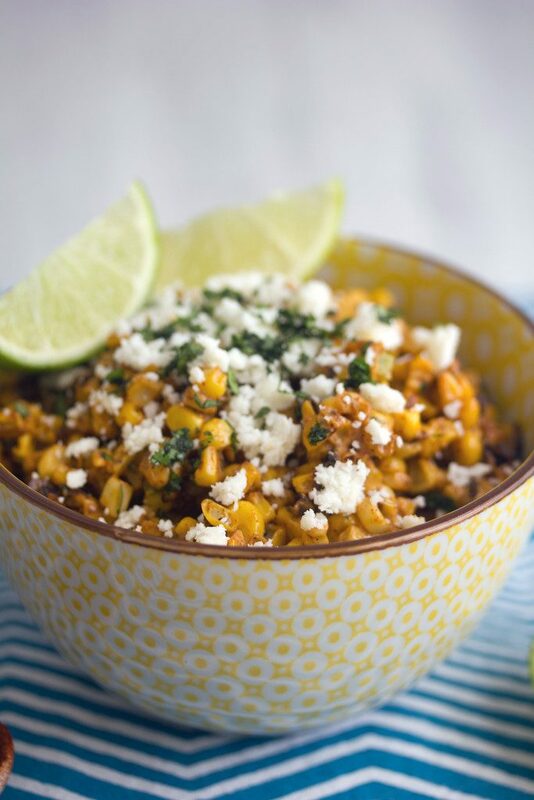 This slightly spicy Elote Salad takes Mexican Street Corn and puts it in a bowl! 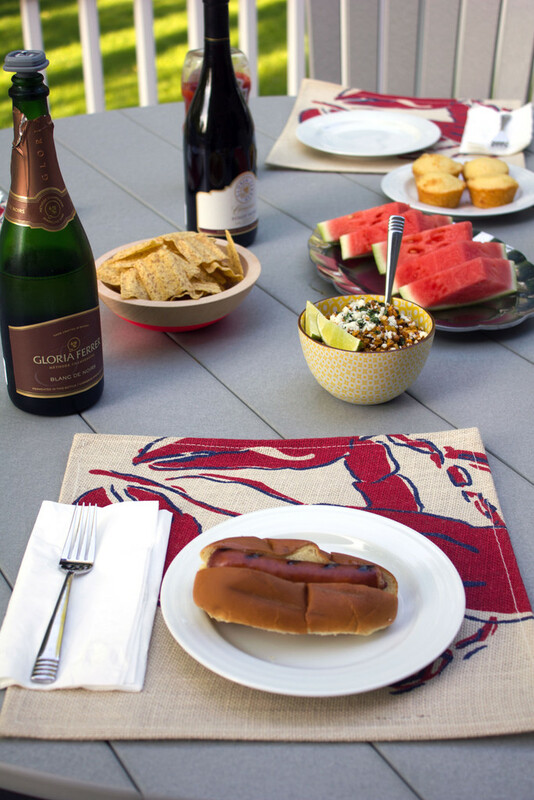 The perfect side to any summer meal. Let’s just talk for a minute about what this week is. Yes, it’s a typical 5-day work week… Don’t remind me. But it’s going to end in a pretty spectacular way. Yes, that means more than just the regular Cocktail Friday. This week is going to end with the start of summer! As in REAL SUMMER. Not that unofficial after Memorial Day stuff. I’m pretty seriously excited about summer for about a billion reasons. I’m psyched over the fact that our lawn is green! And the trees have grown in enough that I can’t see my neighbors’ houses through the bare branches anymore. We went through a lot with our lawn last year and basically spent a lot of frustration and money to get it looking good. After that horrendous Boston winter, I was a little nervous to see what it would look like come spring. Phew! 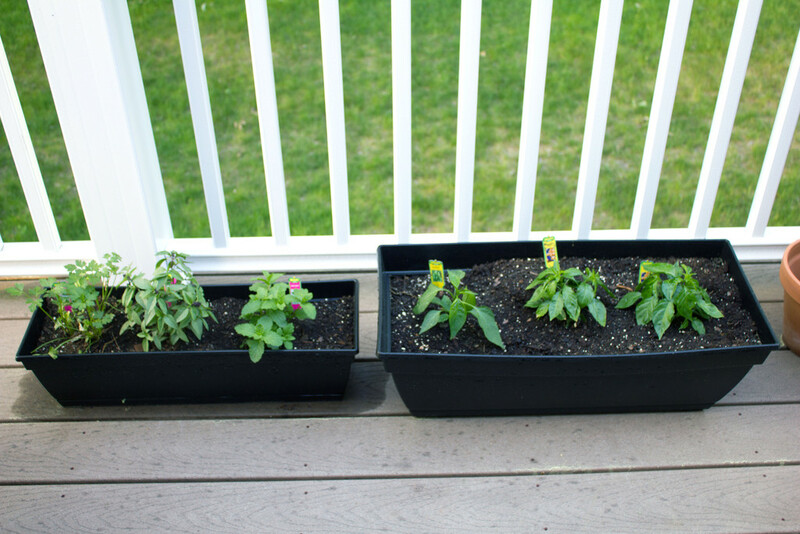 I’m also excited over the fact that our herbs and plants are growing… We even have a couple strawberries! Also? That our new deck furniture has finally arrived! Which means this is basically going to be the best summer ever (and bonus points for the fact that our umbrella was just delivered yesterday). Since we were busy moving into our house last summer, I feel like we didn’t get to enjoy the season to the fullest extent. But this summer is going to be different. Now that we’re pretty much all settled in and actually have a lawn and a place to sit outside, it’s on! I’m planning to have lots of relaxing time at my house with friends and family this summer. 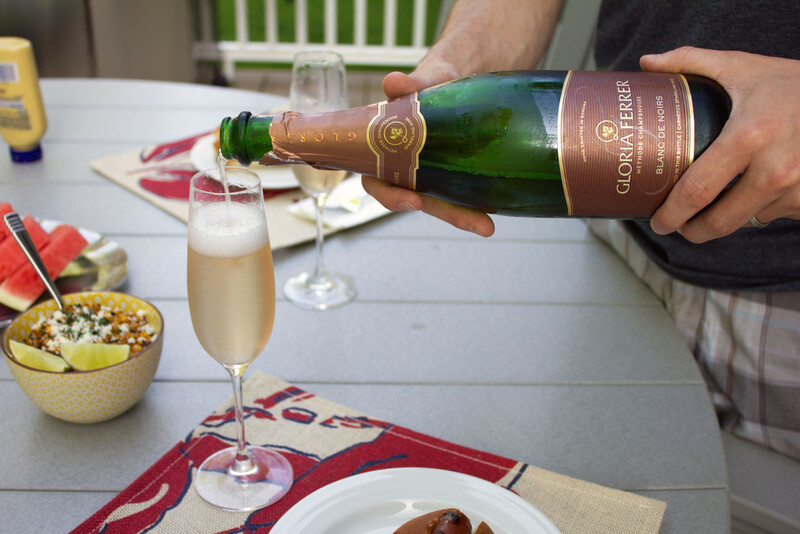 Oh, and lots of bubbly, too. In case I hadn’t made that clear just yet. I’m excited to partner up with Gloria Ferrer for this post to talk about how this summer is going to be glorious. I also made a super seasonally appropriate salad to kick things off. Do you know what elote is? If not, you probably know it as Mexican grilled corn. Well, I love elote. But I’m just not a big corn on the cob person. 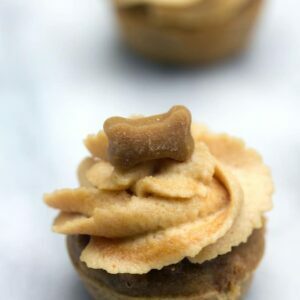 I know it sounds super high-maintenance, but I just hate eating it. And I hate getting it stuck in my teeth. I’d so much rather have fresh corn OFF the cob. Since I rarely ever order it when out, I’ve craving it something fierce lately… So, I decided to make my own elote salad at home to kick off summer! Fresh corn isn’t totally at its peak yet, but it’s getting there. This salad consists of grilling the corn, which you can either do on an outdoor grill before taking it off the cob or in an stovetop grill pan after taking it off the cob. It also involves a little kick from jalapeño, along with a creamy, spicy mayo. The lime juice, cilantro, and cotija cheese cool things down a bit. Obviously this salad is a side dish, but I could totally eat a big bowl of this for lunch, no problem. 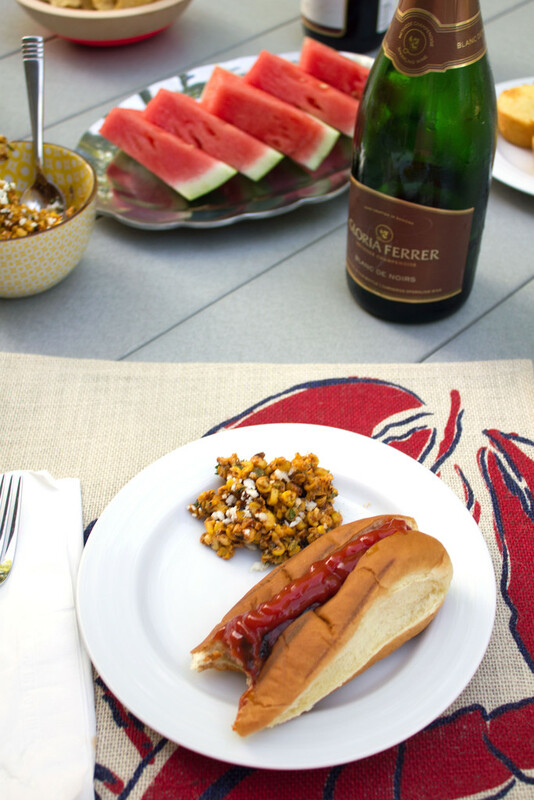 But this time I made it for a little kick off to summer dinner. We kept it simple with Chris firing up the grill for some sausages. And a healthy serving of the elote salad. Chris poured us glasses of Gloria Ferrer Blanc de Noirs. 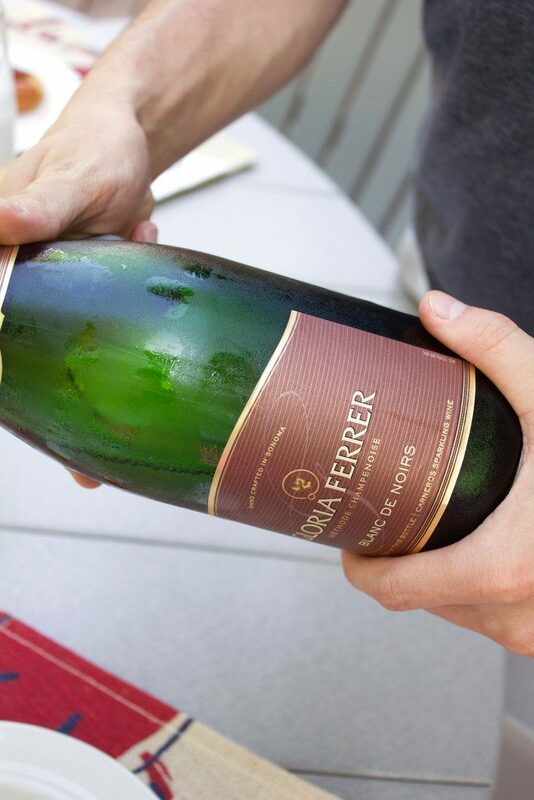 I’m a big fan of this bubbly, touched with bright strawberry and black cherry aromas absolutely perfect for summer. Gloria Ferrer has a special place in my heart as it was one of the first vineyards we stopped at on our Napa and Sonoma trip in 2014. 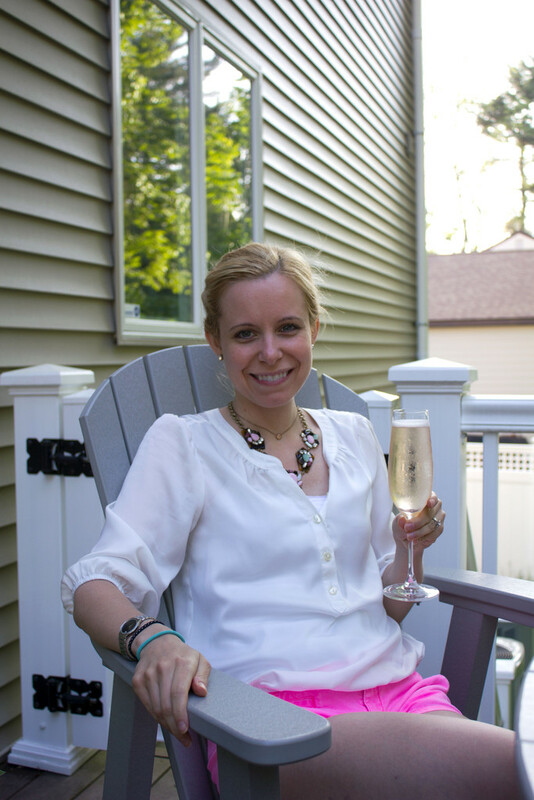 Sitting on the terrace with a flight of sparkling wine and the stunning views was the perfect way to kick off our trip. Seriously, is it time to go back yet?? But i have to admit that sitting here in this glorious weather makes me so, so happy. It was a long winter, you guys; I’m planning to appreciate every single second of this summer. And I feel so incredibly lucky that I have this wonderful man to enjoy it with. 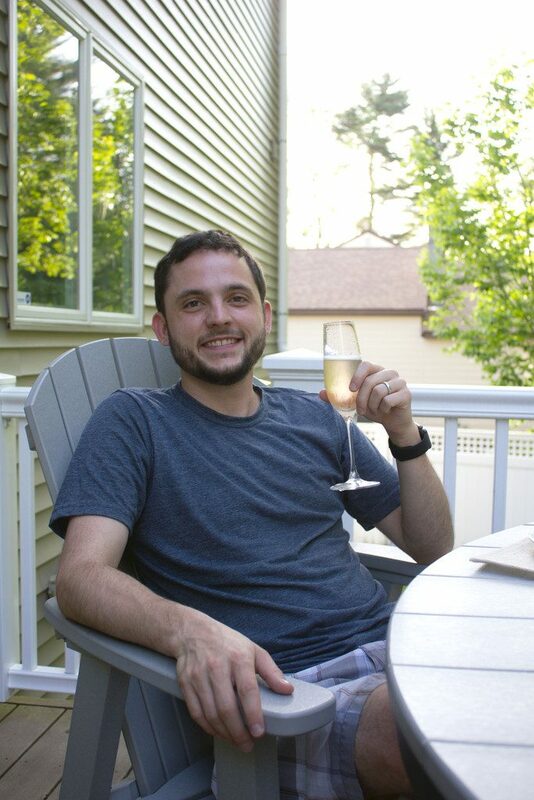 Though he probably thinks I’m crazy most of the time due to how often I exclaim to him, “I love our house!” But I mean, he looks pretty happy, too. Cheers! This is definitely the start of a (hopefully) long (definitely) beautiful summer. And it won’t be the last time this salad makes an appearance. Fresh corn season has just begun! I think I loved this so much because it’s the perfect combination of sweet and spicy. 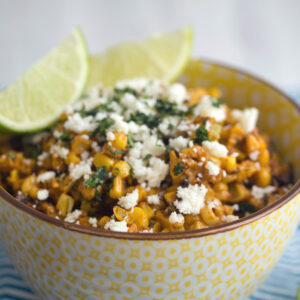 I pretty much always love spicy, but when you add lots of spice to a super sweet corn, it’s heaven. Plus, I don’t eat cotija cheese enough. It has the power to cool down any spicy dish just the perfect amount… Which I suppose is exactly why it’s so popular in Mexican and Southwestern cooking. That freshly squeezed lime juice helps, too! 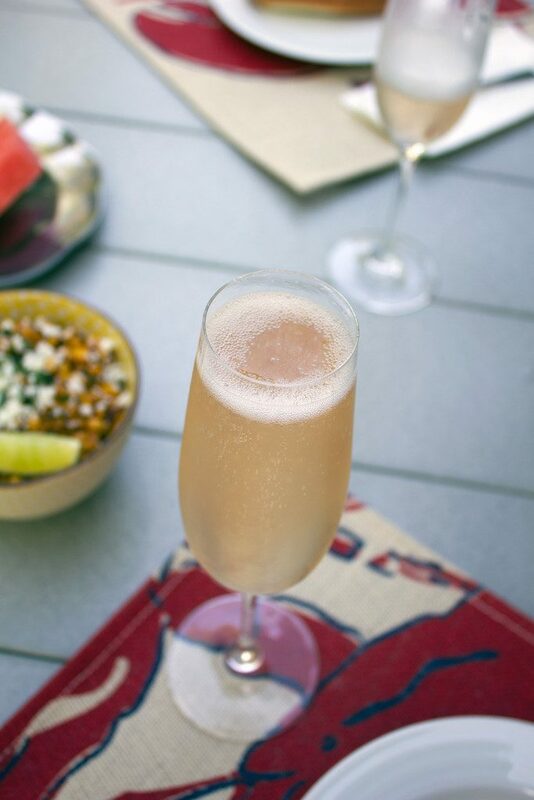 But if all else fails, a good sparkling wine will cool down any hot food… And any hot summer day! Are you a fan of elote? 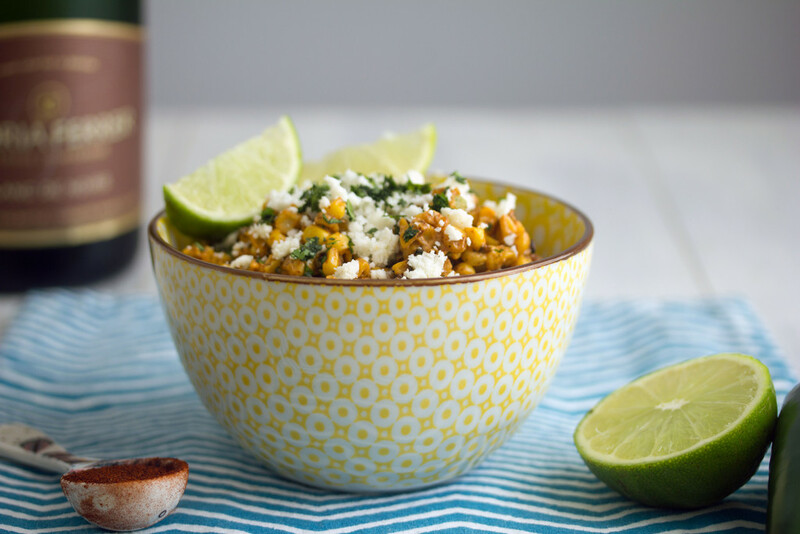 If you’re looking for more fabulous corn recipes, check out my Chipotle Corn Fettuccine or my Chilled Mexican Corn Bisque with Shrimp. 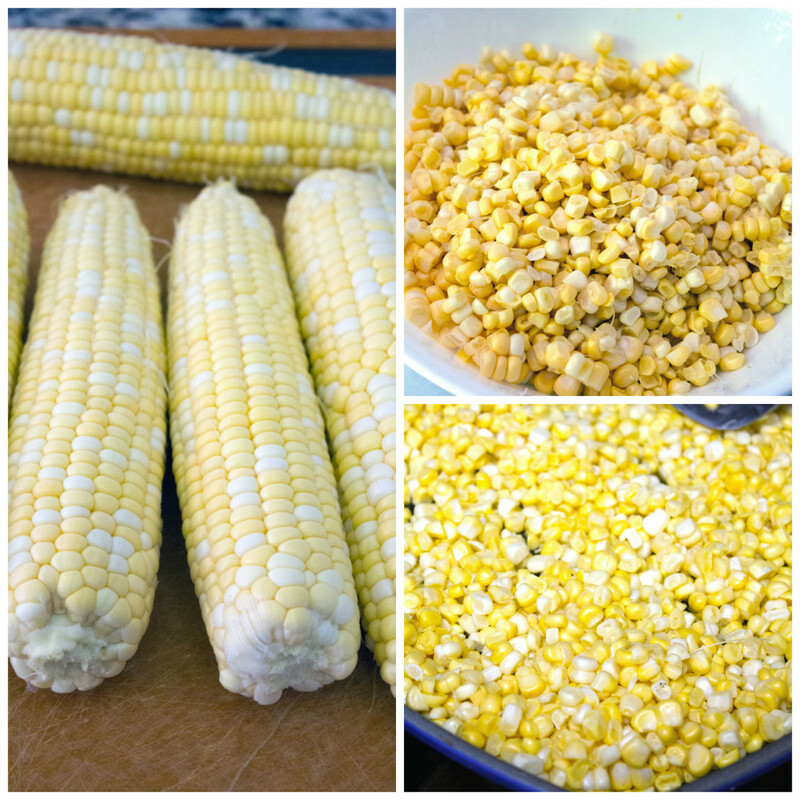 Cut corn kernels from cobs and place and place in a non-stick grill pan or frying pan. Cook for about 8-10 minutes, until just starting to char. Remove to large bowl. Mix in chopped jalapeño, cilantro, and cotija cheese. In a separate small bowl, stir together mayonnaise, chili powder, cayenne, and freshly squeezed lime juice. 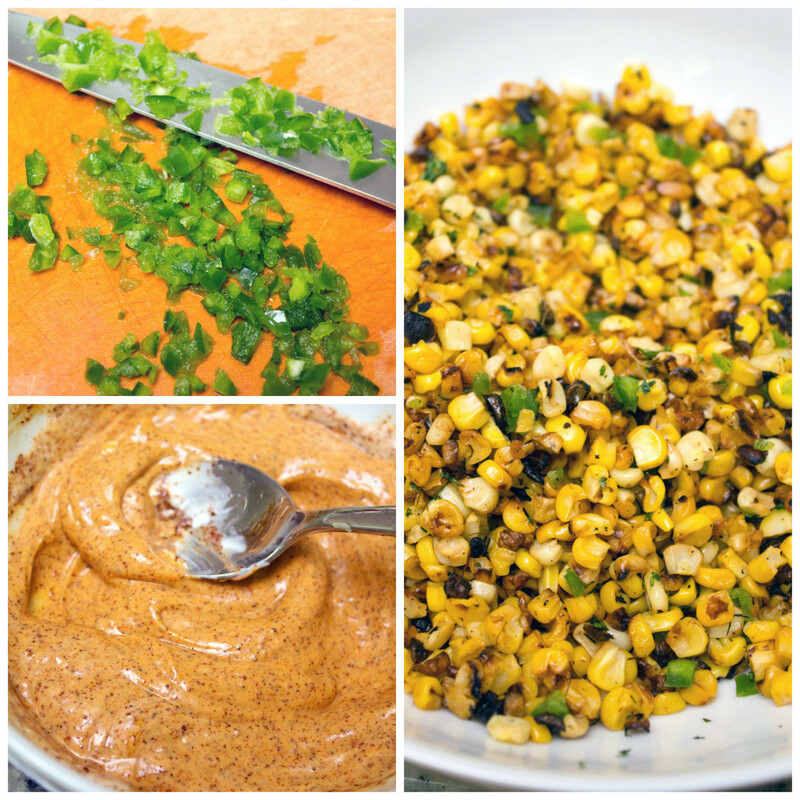 Pour mayonnaise mixture over corn and stir well to combine. Top salad with additional cheese and cilantro. 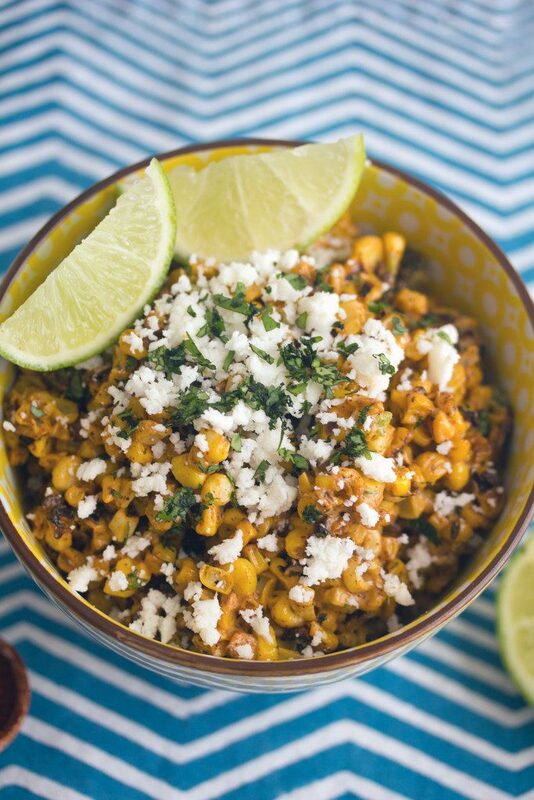 21 Responses to "Elote Salad"
I am obsessing over this salad! What a great post! I am curious to hear how your strawberries do. This elote salad looks amazing! We went to Gloria Ferrer on our first trip to Napa… such gorgeous views there. Coincidentally that was the first time I tried that Mexican style corn on the cob. I love the idea of having it in salad version and will definitely make it this summer! 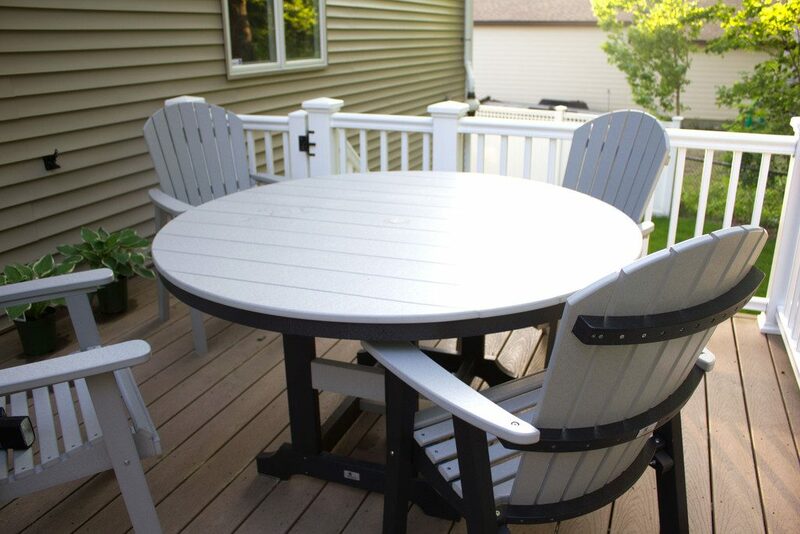 Love your new deck furniture! 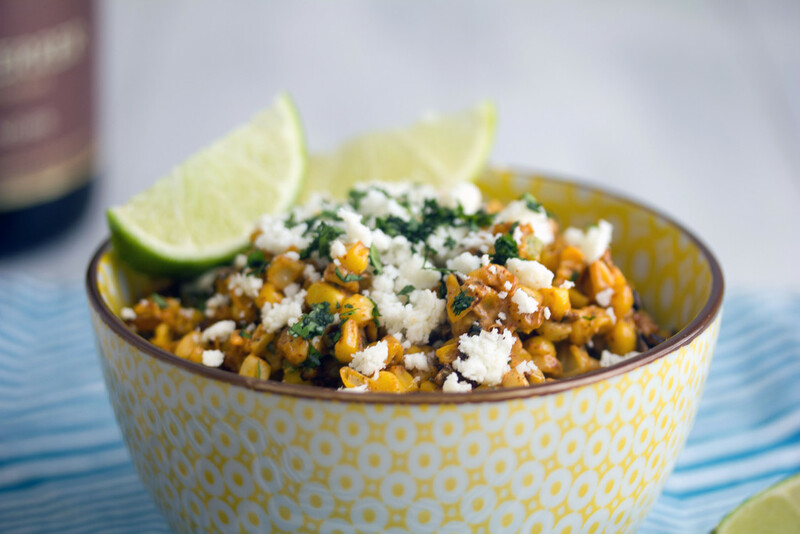 It’s perfect for summer lounging and enjoying light and delicious food like this elote salad. It looks amazing! Your furniture looks great! It’s so nice to be able to sit outside and enjoy the weather. This salad looks delicious, too! Love the pretty color! I love this salad! so much easier to eat than corn on the cob. Beautiful yard and furniture. Enjoy the summer! This salad looks great. Especially with the bubbly. All salads should be eaten with bubbly on a gorgeous deck with new furniture! Looks great!! this salad looks AMAZING! nothing like summer corn! Sparkling wine and fresh corn is really all you need. Love the deck and outside space too! 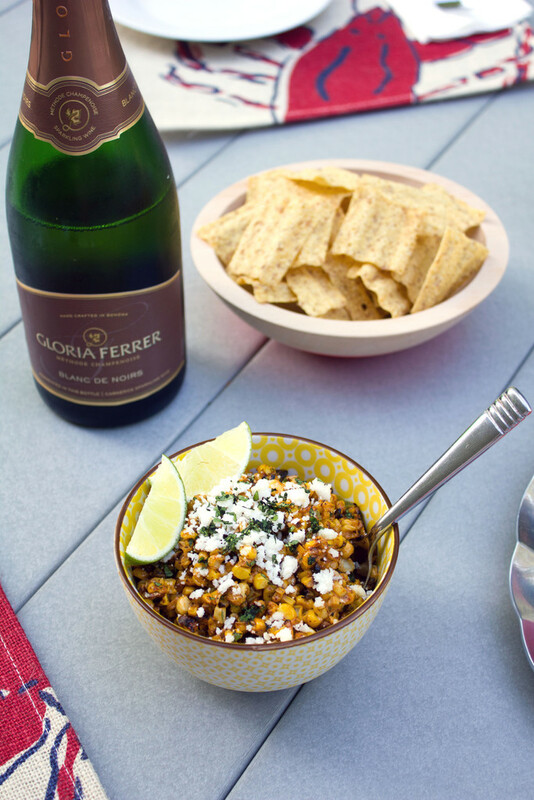 Mmmm – sparkling wine and corn salad…two of my favorites sharing one table! One pretty table….I love it! Oh I’m so glad spring/summer finally came to Boston. You poor people. You should get an extra month of warm after your winter. 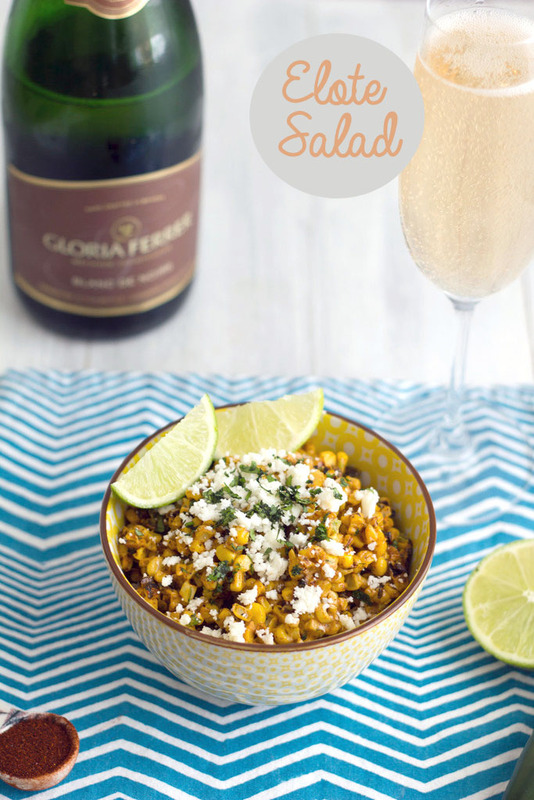 Cheers to bubbly and this new salad I’ve never heard of…but must make! 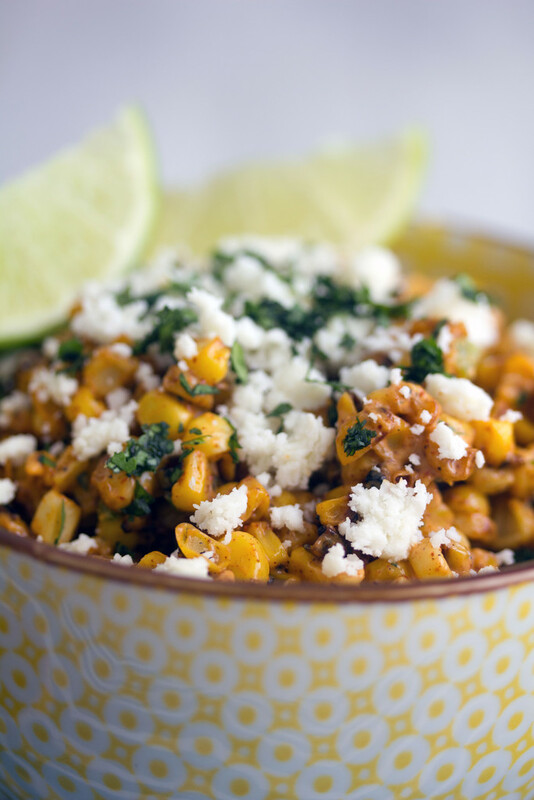 Mmm… the elote salad looks and sounds amazing. 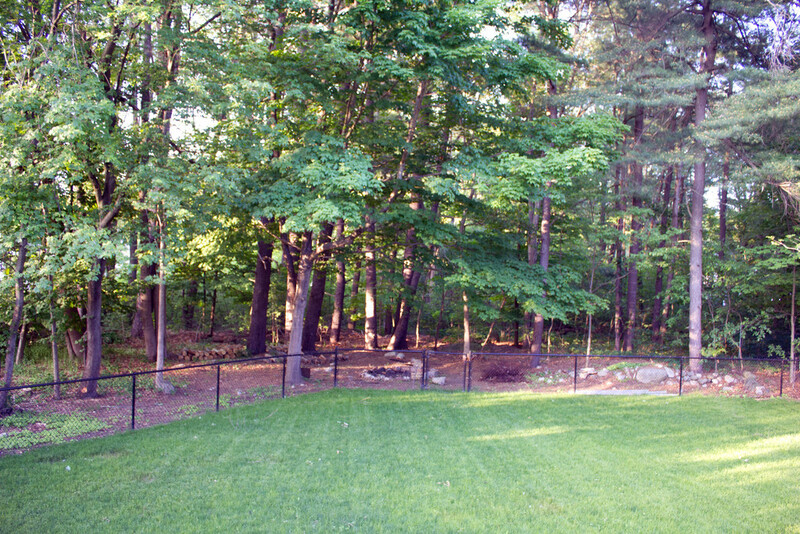 Your yard & trees look fantastic. I think any of us who live in a place with cold winters really cherish our summers. I’d never heard of elote before, but I think your salad looks great! This salad looks so amazing! I love stuff like this. And now you are making me want to sit out on the porch and grill out. And you also made me want a hot dog! YES to Elote salad! I grew up in Chicago where we had many Mexican Street Corn vendors, Mexican street corn salad is the best! This salad looks super delicious! made this. absolutely delicious. used microgreen cilantro leaves from farmer’s market.